Nailtopia shows us her neon dots manicure. Kelsie's Nail Files shares with us her manicure inspired by her new blog design. Haute Lacquer shows us her Feeling Citrus-y nails. Polka Polish shares with us her stained glass nails. MandysSecrets shows us her neon skittles nails using striping tape. Sonoma Nail Art shares with us her "Let's Do It" nails. NAILED IT! shows us her neon gradient using Orly polishes. Make-up/Music/Money/Me shares with us her layering experiment using WnW glitter polishes. Kelly's Nail Blog shows us her "Something Fishy in the Deep Blue Sea" manicure. Polish Obsession swatches Models Own Indian Ocean. Life in Color! swatches Cirque Dark Horse and Epoch. You can submit your links for posts on Sundays here. Manicure Description: This is my cupcake nails! 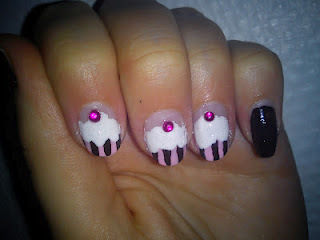 For this mani I used a dotting tool for the icing, a pencil for the base of the cupcakes. French white from H&M, NYX Matte Baby Pink, ESSIE - Little Brown Dress and a pink rhinestone as a "cherry-on-top". Favorite Polishes: I love ESSIE polishes and China Glaze, ESSIE - Trophy Wife, and Aruba Blue are my absolute favs. Favorite Polishes: Too many to many! But my favorite companies are definitely Essie, Opi, China Glaze and Illamasqua! You can find information on how to submit your manicures for Sunday posts here. I need manis for July! Nice! I love your Share with you Sundays!